We have placed around 46 students in various Bluechip & Multinational Companies such as John Deere, Deloitte, Capgemini, CSC, Tech Mahindra and many more. 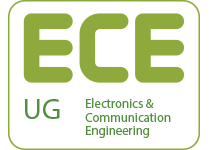 Electronics and Communication Engineering (ECE) is an extensively progressing field, with new ideas emerging every other second. From mobile phones to fiber optics and remote sensing, there are exciting avenues to explore and create. The ECE department at BVRITH with occupancy of 120 seats prepares students for careers in this constantly evolving discipline.